A phospholipid is a type of lipid molecule that is the main component of the cell membrane. Lipids are molecules that include fats, waxes, and some vitamins, among others. Each phospholipid is made up of two fatty acids, a phosphate group, and a glycerol molecule. When many phospholipids line up, they form a double layer that is characteristic of all cell membranes. A phospholipid is made up of two fatty acid tails and a phosphate group head. Fatty acids are long chains that are mostly made up of hydrogen and carbon, while phosphate groups consist of a phosphorus molecule with four oxygen molecules attached. These two components of the phospholipid are connected via a third molecule, glycerol. 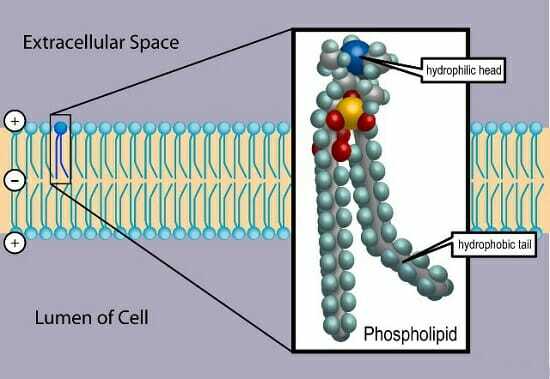 Phospholipids are able to form cell membranes because the phosphate group head is hydrophilic (water-loving) while the fatty acid tails are hydrophobic (water-hating). They automatically arrange themselves in a certain pattern in water because of these properties, and form cell membranes. To form membranes, phospholipids line up next to each other with their heads on the outside of the cell and their tails on the inside. A second layer of phospholipids also forms with heads facing the inside of the cell and tails facing away. In this way, a double layer is formed with phosphate group heads on the outside, and fatty acid tails on the inside. This double layer, called a lipid bilayer, forms the main part of the cell membrane. The nuclear envelope, a membrane surrounding a cell’s nucleus, is also made up of phospholipids arranged in a lipid bilayer, as is the membrane of mitochondria, the part of the cell that produces energy. As membrane components, phospholipids are selectively permeable (also called semi-permeable), meaning that only certain molecules can pass through them to enter or exit the cell. Molecules that dissolve in fat can pass through easily, while molecules that dissolve in water cannot. Oxygen, carbon dioxide, and urea are some molecules that can pass through the cell membrane easily. Large molecules like glucose or ions like sodium and potassium cannot pass through easily. This helps keep the contents of the cell working properly and separates the inside of the cell from the surrounding environment. Phospholipids can be broken down in the cell and used for energy. They can also be split into smaller molecules called chemokines, which regulate a variety of activities in the cell such as production of certain proteins and migration of cells to different areas of the body. Additionally, they are found in areas such as the lung and in joints, where they help lubricate cells. In pharmaceuticals, phospholipids are used as part of drug delivery systems, which are systems that help transport a drug throughout the body to the area that it is meant to affect. They have high bioavailability, meaning that they are easy for the body to absorb. Valium is an example of a medication that uses a phospholipid-based drug delivery system. In the food industry, phospholipids can act as emulsifiers, which are substances that disperse oil droplets in water so that the oil and water do not form separate layers. For example, egg yolks contain phospholipids, and are used in mayonnaise to keep it from separating. Phospholipids are found in high concentrations in many other animal and plant sources, such as soybeans, sunflowers, cotton seeds, corn, and even cow brains. Lipid – a class of molecules that includes fats, waxes, and some vitamins, among other molecules. Hydrophilic – a molecule that “loves water”; it is attracted to water molecules and can usually dissolve in water. Hydrophobic – a molecule that “hates water”; it is not attracted to water, but will usually dissolve in oils or fats. Lipid bilayer – a double layer of phospholipids that makes up the cell membrane and other membranes, like the nuclear envelope and the outside of mitochondria. 1. Which is NOT a component of a phospholipid? C is correct. Each phospholipid is made up of a phosphate group head and two fatty acid tails that are connected by a glycerol molecule. Deoxyribose is not part of phospholipids; it is the 5-carbon sugar found in DNA. 2. Which molecule is hydrophobic? A is correct. Fatty acids are hydrophobic; they are not attracted to water. They are the part of phospholipids that stays on the inside of the lipid bilayer that naturally forms when phospholipids are in a watery solution. 3. What is a function of phospholipids? D is correct. Phospholipids perform all of these functions in the body.